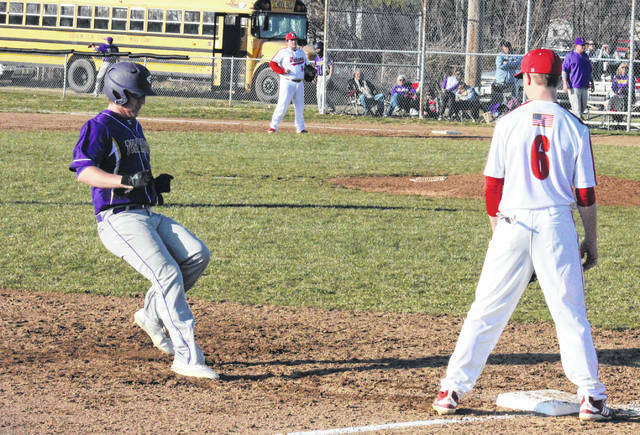 Southern freshman Will Wickline (left) steals third base in front of Wahama junior Trevor Hunt (6), during the White Falcons’ 11-1 victory on Wednesday in Mason, W.Va.
MASON, W.Va. — The White Falcons certainly saved their best for last. 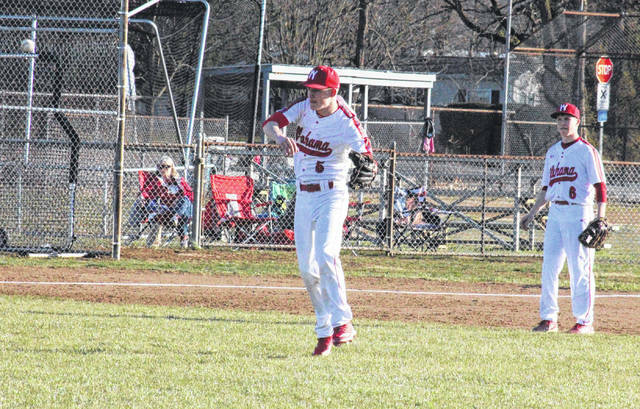 The Wahama baseball team struck for eight runs in the fifth inning of Wednesday’s Tri-Valley Conference Hocking Division bout at Claflin Stadium in Mason County, capping off the White Falcons’ 11-1 mercy rule victory over visiting Southern. Wahama (4-1, 2-0 TVC Hocking) scored a run apiece in each of the first three innings, using a sacrifice in the first, a double in the second and a bases loaded walk in the third. Southern (1-1, 1-1) broke its three-inning drought after a WHS error in the top of the fourth, but the White Falcons took advantage of four hits, three errors and three free passes in the fifth frame to seal the 11-1 mercy rule win. 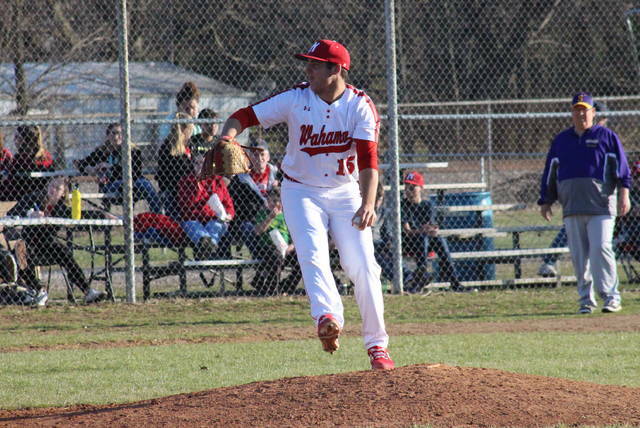 WHS senior Antonio Serevicz struck out five batter and was the winning pitcher of record in a complete game for the hosts, allowing one unearned run, six hits and a pair of walks. 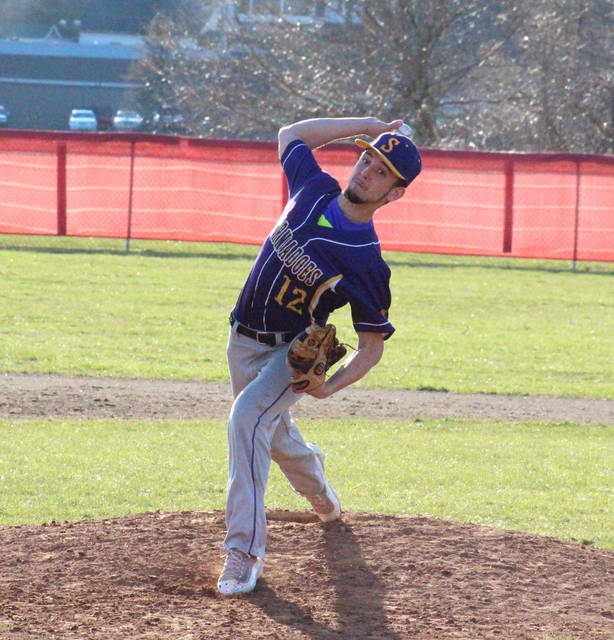 SHS senior Jensen Anderson struck out four batters and took the loss in three innings of work for the Tornadoes, giving up three earned runs on two hits and five walks. Gage Shuler pitched the rest of the way for the guests, striking out three batters, while giving up eight unearned runs on four hits and two walks. Leading the White Falcon offense, Ethyn Barnitz was 2-for-3 with a double, a run scored and four runs batted in, while Jonathan Frye was 2-for-3 with two runs and one RBI. Serevicz singled once and drove in a pair of runs, while Tanner Smith and Tyler Bumgarner both singled once and scored once, with Smith also earning an RBI. Trevor Hunt contributed two runs and an RBI to the winning cause, while Brayden Davenport, Byron Roush, Brady Bumgarner and David Hendrick each scored once, with Bumgarner picking up a pair of RBIs. Southern’s offense was led by Logan Drummer, who was 2-for-3. Ryan Acree doubled once for the guests, Will Wickline singled once and scored once, while Coltin Parker earned an RBI. Anderson, Ryan Acree and Billy Harmon added a single apiece for the guests. Wahama committed one error, two fewer than SHS, and left five runners on base, one less than the Tornadoes. These teams are set for a rematch on April 12 in Racine. Both squads will be on their respective home fields on Friday, with the Tornadoes hosting South Gallia, and the White Falcons welcoming Federal Hocking.